You know you've made it when people care what you were doing at 17 years old. At least that's my take on it. Jennie must be big time for people to want to know what kind of car she drove in high school and how she became part of the infamous Bomb Squad. And we all know how cool the Bomb Squad was is. The funny part is when I sat down to recount who she was and what we did at 17, I realized that 17 year old perspectives tend to be a bit off. Nothing makes that more clear than high school pictures and memories. But the trip down memory lane was fun, if not a tad embarrassing. I should have thought a bit more about what pictures I willingly handed over to be used in her segment, but hey, we were 17. This morning I woke up and was unable to brush my teeth. I had completely depleted my traveler size toothpaste the night before on something far more important than clean teeth and pleasant smelling breath. Bug bites. If you’ve never heard of this home remedy it’s probably because you’ve chosen to go the commercial route and buy something from the store that actually says on the packaging it relieves itching from pesky little tropical critters who’s main purpose in life is to drive you absolutely bonkers. But I didn’t have the luxury of a store. What I did have was a computer and an internet connection. Turns out there are a ton of common household items that will relieve itching, but since I also didn’t have a household, my choices were limited even more by what I could find in my toiletry bag. It was either toothpaste or nail polish. And while nail polish would have been a less needed commodity for the rest of the trip, I only had hot pink. I’m not above plastering myself with hot pink circles for a little relief, but I figured I would go the minty freshness route first that at least I could wash off come morning. I don’t really know if the relief was real or imagined. It certainly didn’t make it disappear altogether per say, but I felt like I could at least manage it and fall asleep. In fact, I woke up in the middle of the night in complete panic as my middle toe was on fire (it seems I accidentally skipped one) and hurriedly tried to squeeze the last bit from the tube so I could cover my toe and fall back asleep. It worked. Today I will walk until I find a pharmacy. Either that, or I’ll stop by the store and get a larger tube of toothpaste. 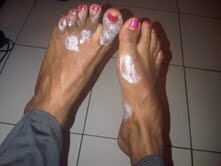 Upon arrival in St. Martin yesterday, our host and meet director wanted to help us experience his island. 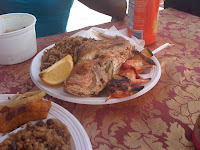 Unfortunately for us, Carnival had ended the week prior… but we did happen to be just in time for Fish Day! “What is Fish Day”, you ask? Well when I first heard him say it I just figured I was having trouble understanding exactly what he was saying and that it was some loose Caribbean term for the festival we were supposed to be going to. But it turns out the festival is all about fish. These people go all Bubba Gump Shrimp Co. on you and devote an entire festival to the preparation and eating of every type of fish imaginable. And you can have it fried…bbq’ed…steamed…stewed…trust me, the possibilities are endless. Being the adventurous person I am, I had some shrimp skewers. There is just something about a fish that seems to be looking at me from the plate that gives me the heebie-jeebies. I tried to capture a bit of video of the day and wanted to share it with you. A couple of things you will notice upon viewing, though. For starters, I really need to read an “Editing Video for Dummies” book, stat. I also need to ban the word awesome from my vocabulary. I’m not a surfer but it seems I want to be.